Angelo Scaglioti’s name is often mentioned in discussions about the Eiffel Tower. But why? 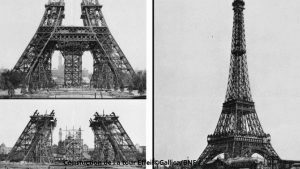 Because he is the only worker who died during the vertiginous construction (318 m) of the “iron lady”, built in 1889 for the Universal Exhibition of Paris. Angelo was certainly not the only Italian on the site. At that time, the workforce from Dante’s country was huge: between 1876 and 1914, nearly 1.7 million Italians emigrated to France. They worked in fields such as agriculture, construction, textile or automotive industry. Italians, like many emigrants from other countries, contributed to the industrial development of France and, with the foreign builders of the Eiffel Tower, to the international influence of Paris. You want to learn more about Italian immigration in France ? A little tour here in the records of the Museum of the History of Immigration.